So it was Saturday night and hanging close to beer o'clock so decided to take the bike out for a ride and visit a mate for a couple of cold ones. While I was there his neighbour who heard my bike arrive, popped his head over the fence for a peek at the bike. Turns out was an old mate from back in the days of recklessness. We get talking and tells me how he's got this sweet bike and tells me about all the rides we can go on together as he's been looking for a riding buddy. So I get invited over to his place to check out his RF 900. Not the most pretty bike to begin with. What I saw blew my mind. Now we all know that 9 times outa 10 its "the other person" we have to watch out for while on our beloved machines to avoid any accidents. Not this time trend setters. 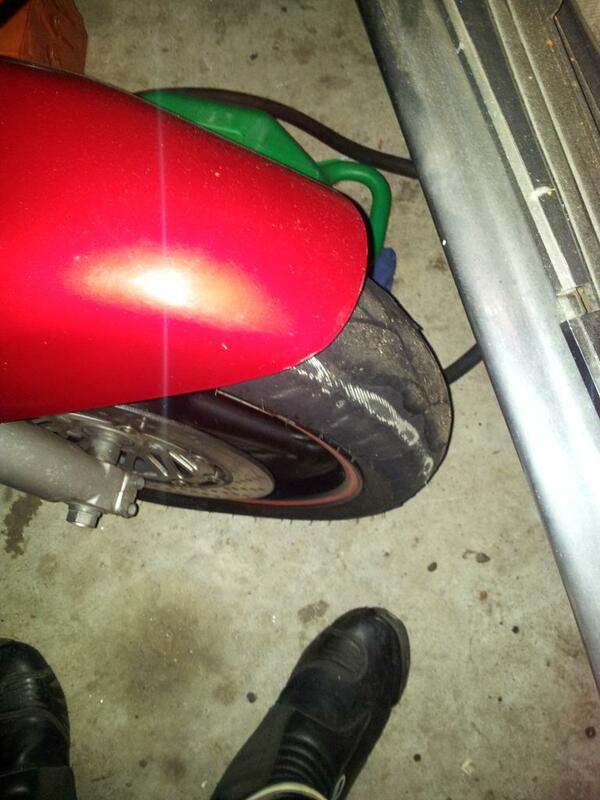 Check out this pick of his front tyre. I could say words don't describe it but in this case I'm thinking words like, fool, dork, crazy, mad, unit etc. Guys a danger to himself and other road users and I told him so with a few F's thrown in for good measure. So here's the dreaded pic. EDIT: Whoops - Never mind, I didn't look closely enough at the picture - I thought the fender was discolored, but it's just the camera flash. I therefore thought that the fender rubbed the tire like that. But yeah, that's pretty bad. However, that can't be the only problem. His forks must be bent or uneven... or something - to cause that sort of wear. Last edited by Conrice; 05-03-2014 at 09:40 PM. Makes sense. Something has caused it, still I think he's just a cheap bugger haha. Ha! You're right - he should have at least replaced it by now. And I'm sure it doesn't ride right... I bet you take your hands off the handle bars at speed and the bike veers hard to the left. Did the back one have some really weird wear on it too? Back tyres was mint, whole bike was very tidy fr its age, has some nice bits on it. I especially like the pilion passenger peg set up on it. Looks bloody nice. Maybe he swings the bike harder on right hand bends. In saying that he's about 95-100kg fella. I looked at the travel of his front forks using the dust mark as a guide and he got about 180-190mm of travel there. Could that be it? I might be wrong but isn't 140mm about where your travel should be? Could also be the preload adjusters are way way uneven? I didn't check. No way that can be ride wear, or he has a hobby of going to the parking lot and getting dizzy by spinning hard to the right. The tire must be rubbing onto something. No way I'd ride that. That's why I said in my original post I was confused. I had a fender drop onto the tire one time - a tire will eat that plastic within a mile. Other than the fender, what else could rub on it?